Abraham Zinone took the lead in helping his son, Abraham Junior, receive lifesaving medicine after the boy tested positive for HIV through the Strengthening the Provision of Primary Health Care (SPPHC) Project in South Sudan. When Abraham Charles Zinone and his wife Merry brought their son to the Jhpiego-supported Strengthening the Provision of Primary Health Care (SPPHC) Project in South Sudan, a skilled health care provider did a thorough assessment of Abraham Junior’s health, including testing for HIV. Abraham Junior, just 2 months shy of his second birthday, tested positive for HIV. His health was further complicated by poor nutrition and parasitic and opportunistic infections. Health care providers gave Abraham Junior oral rehydration and iron supplements for malnutrition, started him on antiretrovirals (ARVs), treated his infections and offered nutrition counseling to his parents. Abraham Junior was born in a refugee camp in the Central African Republic, after his parents fled their home in war-torn South Sudan in 2015. Merry gave birth without a skilled health care provider with help from her husband, Abraham, and fellow refugees. To add to their difficulties, both Merry and Abraham are HIV-positive and Merry has epilepsy. The Zinones have been caught between war and internal conflict in their homeland, compromising their already fragile health and the health of their son. The South Sudan civil war has claimed tens of thousands of lives and has displaced more than 2 million people. The conflict has also destroyed social and economic support, further deteriorating an already weakened health system. Many people living with HIV who were receiving care, like Merry and Abraham, can no longer receive supplies of ARVs on time. The war has worsened the HIV situation and aggravated opportunistic infections. Children are dying from malnutrition, preventable diseases and poor sanitation. 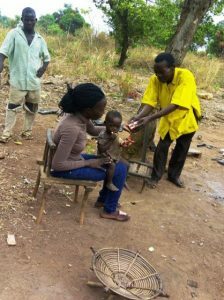 Rebecca Apio, HIV Case Manager (seated), checks on Abraham Junior and finds he has gained weight and is an active toddler. During a lull in the fighting, Merry and Abraham returned from the Central African Republic to South Sudan and took their son to Source Yubu Primary Health Center, where they had previously received care. The center had been ransacked by rebels and was no longer operating. Abraham Junior had become very sick with a severe cough and was pale and malnourished. The health of Merry had also worsened since she had no access to health care and was still recovering from the birth of her son. However, at the SPPHC Project, Abraham and Merry received care and supplies of ARVs. Abraham, Merry and Abraham Junior are among 71,200 people who have received services from the SPPHC Project since the project started in June 2015 in Central Equatoria and Western Equatoria States of South Sudan. With funding from United States Agency for International Development (USAID) for the SPPHC Project, Jhpiego is working with the South Sudan Ministry of Health to rebuild the health system and provide quality health services to returning refugees and displaced persons. The project is partnering with the South Sudan Health Pooled Fund partners—Action Africa Health Initiative, The Johanniter and World Vision—to equip health care providers with skills and furnish primary health care centers with supplies. The project also organizes community outreach activities to increase access to high-quality services for the prevention of mother-to-child transmission of HIV and HIV care for children, adolescent and adults. More than 41,000 pregnant women have received testing and counseling services during antenatal care visits provided by the SPPHC Project. All 1,581 women who tested positive for HIV started ARVs to prevent transmission of HIV to their unborn children. In addition, the SPPHC Project provides follow-up support to the community. 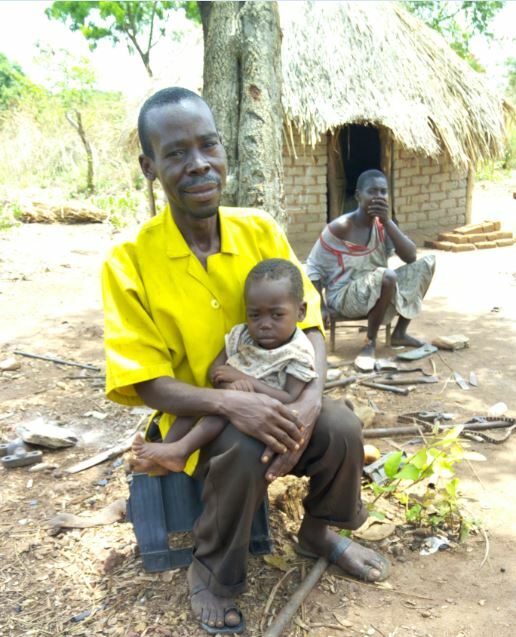 During a recent visit to the community, Rebecca Apio, a Jhpiego HIV Case Manager working with the SPPHC Project, conducted a review of health records and noticed that Abraham Junior had missed an appointment. She and her colleagues sought out the family in their village and assessed Abraham Junior’s progress and that of his parents. They provided the family with counseling, replenished their ARVs and gave Abraham Junior more nutritional supplements. Abraham couldn’t be more relieved. Dr. Bizunesh Tesfaye Tamirat is Chief of Party for USAID’s Strengthening the Provision of Primary Health Care (SPPHC) Project in South Sudan. Rebecca Apio, SPPHC Project HIV Case Manager, and Charles Wanga, Jhpiego’s Africa Region Senior Communications Specialist, also contributed to this story. Photos by Patrick Ochira, SPPHC Project Monitoring and Evaluation Officer.